Too Yarn Cute Crochet is an on-line crochet magazine that I discovered through Facebook. In a PDF format it allows you to bookmark a section to take you to the pattern you want and includes links straight to the designers stores (though that bit hasn’t been so great for my pattern addiction!!!). 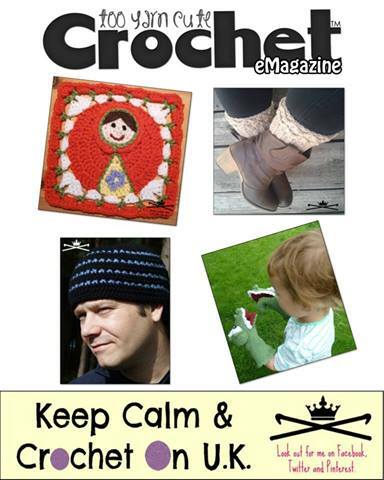 It’s a Quarterly Magazine, with issues for each season of the year so you don’t have that ‘long’ wait between issues you get with some of the more conventional crochet magazines and they also have “Speciality” Issues for those in-between months. If you are on Facebook make sure to give their page a like as they always include offers for the magazine and sales from designers on their Facebook page. The magazine itself has featured patterns from many of my favourite designers and has introduced me to new designers that I hadn’t yet discovered. 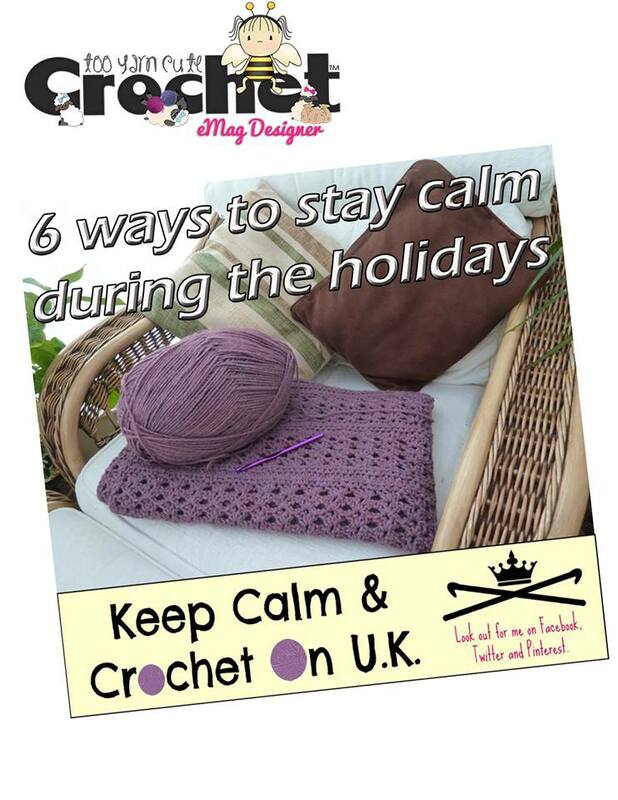 I was invited to write an article for their Christmas edition which became ‘Six Ways to Keep Calm during the Holidays’ and included tips for those trying to manage a crochet business and family and friends at the busiest time of year. I really enjoyed my little foray into crochet journalism and was super excited when I was shortly asked to be the featured designer of the Winter 2013 edition. It turned out to be a fabulous experience for me personally as well as a challenge. I wanted to design new things that I hadn’t done before and this provided me with the perfect platform to get my creative juices flowing! I put on my thinking cap and eventually 4 brand new designs were born for the issue; Mr Croc Hand Puppet, Russian Doll Afghan Square (There just had to be a square pattern! ), Ice-Flash Men’s Hat and Cowl Set and Loopy Ridges Boot Cuffs (Toddler to Adult). After all that fun you can bet your bottom dollar that I jumped at the chance to do something for their forthcoming baby edition! Now I love, love, love blankets and had an idea floating around in my head for a while about a blanket with elephants so it seemed that what was eventually created was destined to be! Allow me to introduce my ‘Elephant’s On Parade’ baby blanket! I do love the versatility of this blanket, I made it in blue but my testers made one in pink for a baby girl and ones in yellow and rainbow colours (see photos on my Facebook page) for occasions where baby’s gender is a surprise. 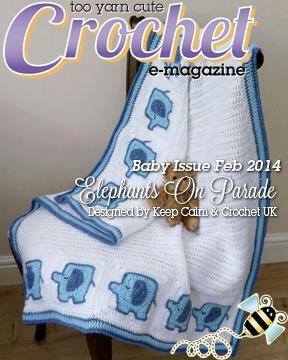 As well as the Elephant’s On Parade baby blanket in the Baby Issue of Too Yarn Cute Crochet Magazine I’m also offering 20% discount on all my Ravelry patterns to readers – code in the magazine.